This has been on my mind a ton lately as I go around and read and comment on other bloggers' posts. I just keep stepping back and realizing: wow, this is incredible. You guys. All of us. This community of teenagers and young adults writing, blogging, reaching, dreaming. Think about it. Not everybody does this stuff. Not everybody sits down for several hours and grinds out a blog post every week or so for someone to read. They don't even know if someone will read it, but they do it anyway, waiting for one person to come by and say "wow. this is great. keep it up." And no, they're not doing it to get applauded for their efforts, but because they have a dream. The cool thing is, they're not all the same dreams. Some of us want to be best-selling authors. Others are writing a story for their sick friend. Some are artists, painters of sound or images, aiming for the stars of a professional career. Or we just want to lead our church's worship band for the rest of our lives. Yet we're here, online, writing about it and sharing it with other people. Even if that dream is as small as working at your local coffee shop, it's a dream. Sometimes I look at the blogging world here, and I imagine us all in the same room, each singing our own song. Yet when the voices rise, they mingle together into one of the most beautiful songs in the world. A bunch of young people chasing after their dreams. A bunch of young people doing what they love. A bunch of young people on a mission. And when you look at it like that, it may not seem like much. But it is. I may not know this as much as I could. I've only been in the blogging world for coming on six months now. But I remember going to a teenager's blog for the first time, reading the post, scrolling through the comments, and thinking to myself "Wow. Look at all of this support and community! These people are amazing!" I was awestruck by all the passion (and wondering why I hadn't found it yet). I was almost tentative to join in, wondering if I could be one of these wide-eyed determined dreamers, reaching for stardust and sunlight. Then I hopped in and started meeting you all. That's when I realized how similar yet different we all are. When I'm reading other posts or replying to comments, sometimes I sit back and just stare, because it's so amazing. There's so many people out there, so many blogs I visit, yet I feel like I know everyone in a special way based on how they pour their heart into what they write. And you know what blows me away the most? The support. The love. The community. We aren't a mass of dreamers shoving down our friends so we can get a leg-up. Yeah, we might be competitive at times, but we're making an effort to help everyone succeed. Because when one person does, it feeds the flames of our burning desire to make our dreams own come true as well. Seriously. The support around here makes me want to cry sometimes it's just so beautiful. The world needs more of that, guys. I think every single one of us has the power to make a difference in the world. We're readers. We're writers. We're singers. We're artists. We're weavers of words and stories, beams of light, stars in the night, pricks of hope and brightness in the world. We're on fire with passion and out on a mission to accomplish our dreams. And...I think God's smiling at us, smiling at His young soldiers as they go off to fight for Him, aflame in His Spirit and Truth. But we're not alone. No. Whether we blog by ourselves or collaborate, we're amazing. I don't care if you're a painter of words, objects, stories, or ideas: He's going to use you, fellow dreamer. What are you a painter of? What's your dream? The blogging community is one of the most beautiful communities I've ever been a part of, and I'm happy to say that I relate to this so much. I think, because of our similarities, we built each other up and thus the reason for the tight-knittedness, but because we all have different aspirations, it diversifies who and what you read about. It's just amazing. I have a confession to make... I don't spend hours writing blog post right now, because I pre-wrote them over summer 0o0 okay joking aside I totally get what your saying. Back when I started my blog I was like "will anyone even read this? well if they do what kind of comments will I get, mean ones?" (honestly I'm still waiting for someone to leave a mean comment) but I'm blown away at how nice these people in the blogging world are. I can't even believe people from different places stop by every week to read my post, let alone comment on it. Great post you've expressed exactly the why I have been feeling lately! I just found your blog and I'm so happy that I did!!! I really enjoyed reading this post! Keep up the good work Audrey!! Wonderful post. 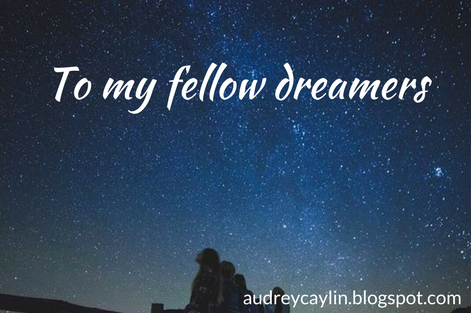 Thank you so much for writing this, Audrey. aaaaah thank you, Sarah <3 Thanks for reading! Ahhh this post is just so beautiful and encouraging and adsjkflhakjsdfhksdj <3 <3 <3 I am a painter of words and I am a dreamer of books on shelves and in hands of children and young adults, filled with hope and wonder. This is a beautiful post, Audrey, and one I certainly agree with. As a very new blogger myself I have been amazed by the incredible community and the support and kind words everyone shares around. Amazing post, Audrey. I'm constantly in awe of the blogging community and the support and love that goes round. It's incredible (and I've almost cried on occasional, but don't tell anyone ;) and I'll forever be honoured that I'm a part of it. Thank you for beautiful posts like this. Wow. Just... Wow. This is how I feel about this awesome writing community that we're a part of. And that last part.... This post was AMAZING, Audrey! A sweet post Audrey! The blogging community is wonderful! I have met some lovely people through it and been encouraged by many more! Right?!? I was so shocked when people started showing up on my blog leaving nice, encouraging comments. Connecting with everyone is one of my favorite things about blogging now. I know :P Sometimes I scroll through other comment sections and just soak up the love and encouragement in this community. It makes me want to help and support everyone more myself. THANK YOU SO MUCH, Micaiah. <3 <3 <3 Your support and everyone's support...it's amazing. I hope I will be forever awed by how we share love and encouragement around here. I know. I wish there were 72 hours in a day so I could be on everyone's blogs all at once and share gratitude and support everywhere. Wow. This is so true! (I know I'm way late to comment but I just had to.) I have been amazed at the support the blogging community has given me, and I've only been blogging for a little over six months. Everyone is so kind! :) Thanks for this post!